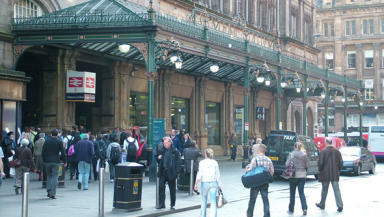 Six men are to appear in court after an incident outside Central Station on Saturday night. Six men have been arrested after a large-scale disturbance outside Central Station on Saturday night. The disturbance took place at 7.20pm outside the Hope Street entrance of the station. It is understood the incident involved Hibernian fans returning from the Ayr United v Hibernian cup match. British Transport Police say that between 30 and 50 people were involved in the incident, which left one man in hospital. The men are aged between 24 and 48 and will appear at Glasgow Sheriff Court on Monday.